The astrogeographical resonance degrees of Vienna and transits of the outer planets in relation to the political center and government of Austria. Astrogeographical resonance degrees for the City of Vienna for morphogenetic field level 1 (region) which describe the supraregional. international resonance topics of the capital and goverment of Austria: the astrographcal positions of Austria are 17° in highly magnetic, self-centered, royal fire sign Leo the sign of centralism, absolutism and monarchy 13° in solid, conservative, traditionalistic, hierarchical, strict earth sign Capricorn the sign of history, control, rules and regulations, the ruling classes, formalism, austerity and efficiency. 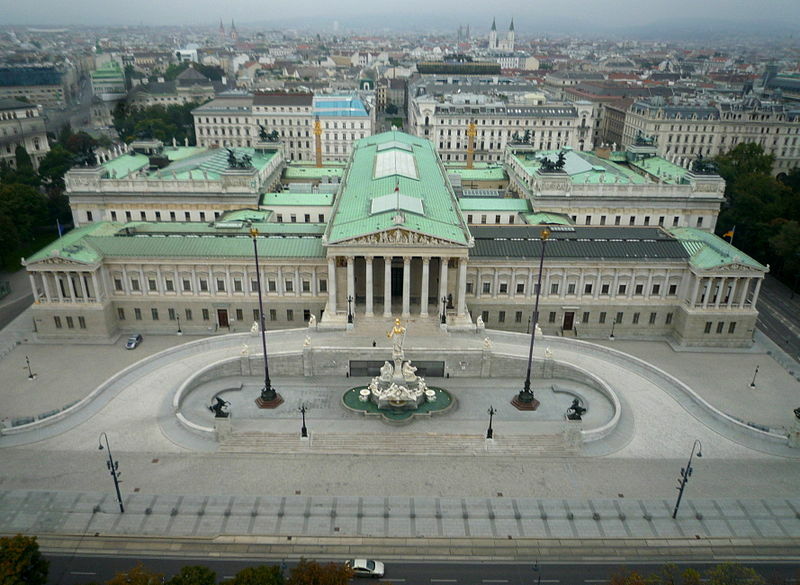 The first Austrian Republic was first proclaimed on 30 Oct. 1918. On 3 November the armistice of Villa Gusti formally ended the war between Austria and Italy. Karl I the last Habsburgian Emperor of Austria had to step down on 11 November 1918 with the Sun indicator for kings at 17°Scorpio and in a strong and exact square to the 17°Leo astrogeographical resonance coordinate of Vienna. On 12 Nov. 1918 at 16:00 the “Republik of Deutsch-Österreich” (“German-Austria”) was proclaimed but with the Moon on 1 °Pisces the degree of instability and invalidity. The new constitution passed the National Constitutional Assembly on 1 Oct. 1920 with Pluto at 9°Cancer nearing the opposition degree to the 13°Capricorn resonance coordinate of Vienna and with neptune at 9°Leo approaching the conjunction to the 17°Leo coordinate. Both transits which were yet to unfold their effects explain the lastingness of the falling apart of the Austrio-Hungarian Empire in the course of WWI and the period after. The transit of Uranus the planet of revolution over 17°Aquarius the exact opposition degree to the 17°Leo astrogeographical resonance degree of Vienna had its climax between January 1916 and November 1917 (Russian Revolution). This transit stands for the changes that became inevitable for Austrian society durig WWI. The resignation of Emperor Karl I, the end of the monarchy and the proclamation of the republic are symptomatical result for a Uranus opposition.. The square transit of the Sun to the resonance degree of Vienna at 17° in the Suns own sign Leo and sign of emperors and kings delivers a strong explanation for the personal resignation of the emperor. Jupiter the planet of victory, conclusions and aims at 15°Cancer in exact opposition to the 13°Capricorn astrogeographical resonance coordinate of the capital shows the victory of the enemies of the old hierarchy, traditionalism, ruling classes, formalism and other irreformable aspects of the Capricorn resonance. But Jupiter in Cancer though opposed to the capital stood also in the very center of the sign of fertility, pregnancy, emotional identity and authenticity, spirits of ancestors, the interior and sign of the national morphic field (the so called “Volk”). This means that such oppositions have positive systemical impacts for capitals and should not be judged as solely destructive. And this one in particular as it stands for the process of the birth of the independence of the Austrian nation from the Imperial relics left over from the Holy Roman Empire though in times when that independence was still under strongest pressure from the upcoming transits of Pluto in opposition to the 13°Capricorn coordinate (climax 1924-28) and Neptune (1922-25) conjunction transits. 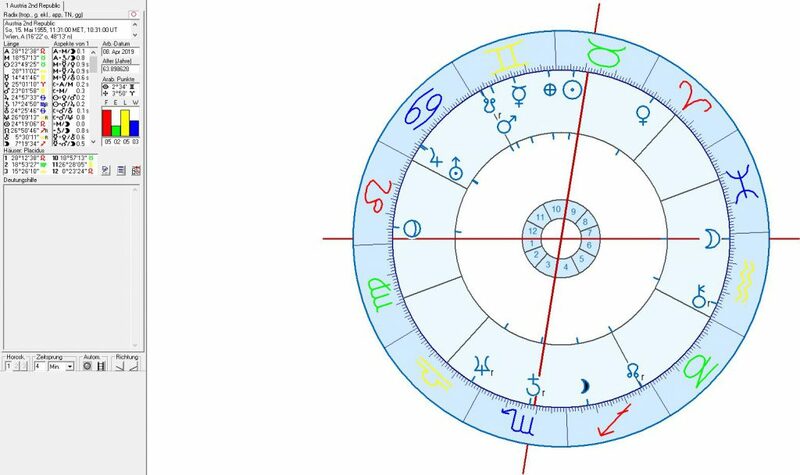 World War II had begun during the Uranus square to the 17°Leo coordinate of Vienna from 17°in Taurus the sign of possession and control of a country`s own national territory, legal autonomy and food production. Uranus stood for the hype from the influences from globalization under the control of Vienna in the hands of an Austrian native as dictator of Germany. The climax of the Pluto transit in onjunction to the 17°Leo coordinate of Vienna was from August 1948 until June 1952 must have transformed the projections and habitual patterns of perception from overlyy from the traditional, royalistic austro-hungarian self-image over the Austrian nation and its capital. Even more so because of the simultaneous pressure through the square transit from Neptune the planet of self-cleaning and self-healing processes through depression between October 1947 and September 1950 asd the opposition transit of Uranus between August 1951 and July 1952. The reflected by the Allied Occupation. 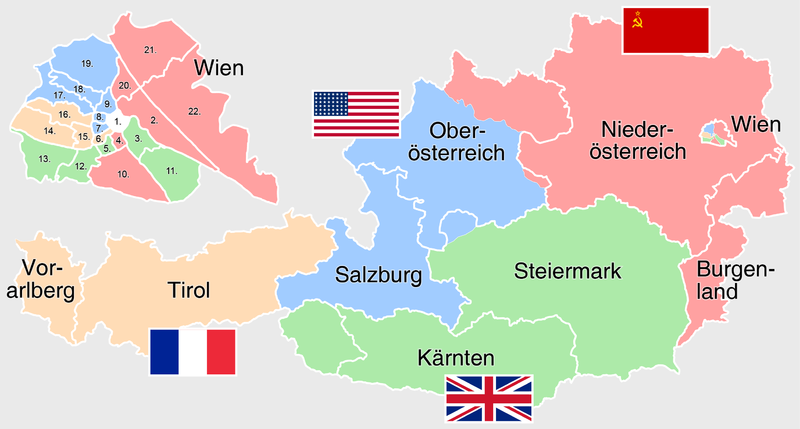 The signing of the Austrian State Treaty on 15 May 1955 re-established the sovereignty of Austria and decided the end of the Allied Occupation of Austria. It is fascinating to see that Saturn the planetary indicator for the legal effectivity of decisions was conjunct the IC the indicating point for the national morphic field and the land itself in a constellation of cutting the umbilical cords with the emotional and factual dependence. 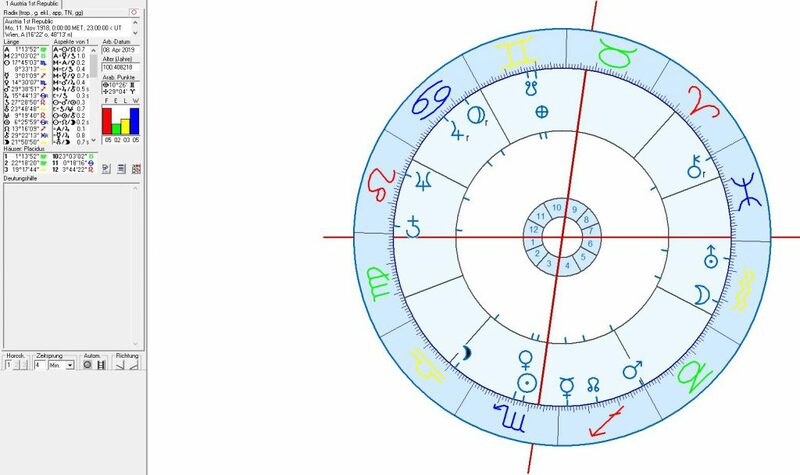 The position of Saturn at 17°Scorpio was exactly square the royalistic, monarchistic and centralistic impact of the 17°Leo resonance coordinate of the capital Vienna. The annexation of Austria into Nazi Germany ended Austrian independence on 12/13 March 1938. 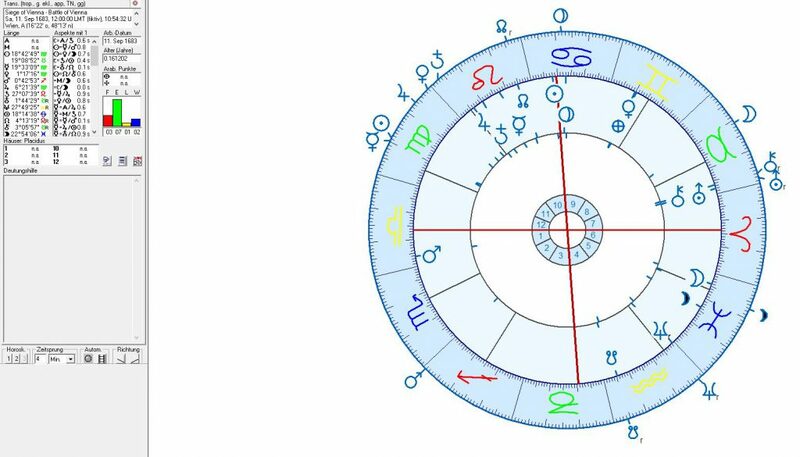 The transit of Uranus the planet of globalisation and foreign influences over 17° in Taurus the sign of occupation of territory to the 17°Leo resonance coordinate of Vienna had its actual climax between May 1938 (15°TA) and November 1939 (20°TA). It led to the annexation of Austria and dragged the country into WWII with the exact square (17°TA) to Vienna on September, 1 1939. The Nazi annexation of Austria was carried out during the Mars ingress into Taurus the sign of possession of territory which activated the full consequences of the coming square transit of Uranus to the 17°Leo coordinate of Vienna. Jupiter the planet of expansion and aims had been transiting the exact opposition degree to Vienna at 17°Aquarius since the first days of March 1938 with Uranus as the sign ruler of Aquarius deciding the direction in which Jupiter would turn. The astrogeographical resonance degrees of the ottoman capital Istanbul are 17°Capricorn and 6°Cancer. 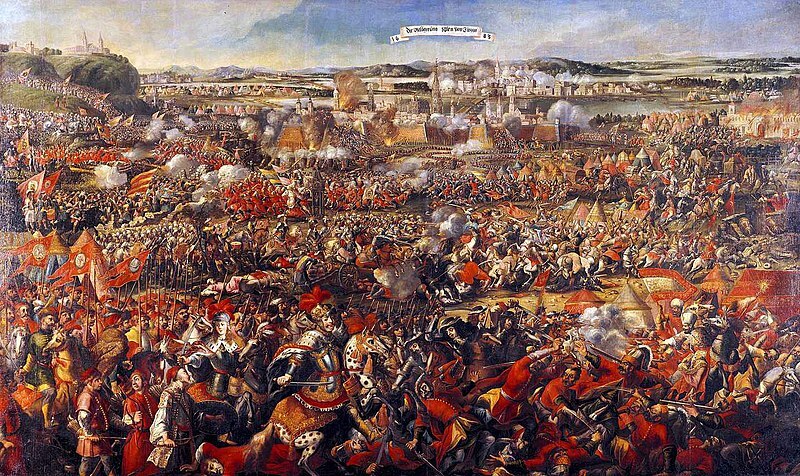 The first turkish Siege of Vienna between 27 September–15 October 1529 was an ettempt of the turkish Sultan Suleiman I the Magnificent to conquer the City of Vienna. The area of the Austrian capital had played an important strategical role for the control of the Danube River`s entry towards the Holy Roman Empire and as the seat of the House of Habsburg home of the HRE emperors since 1438. 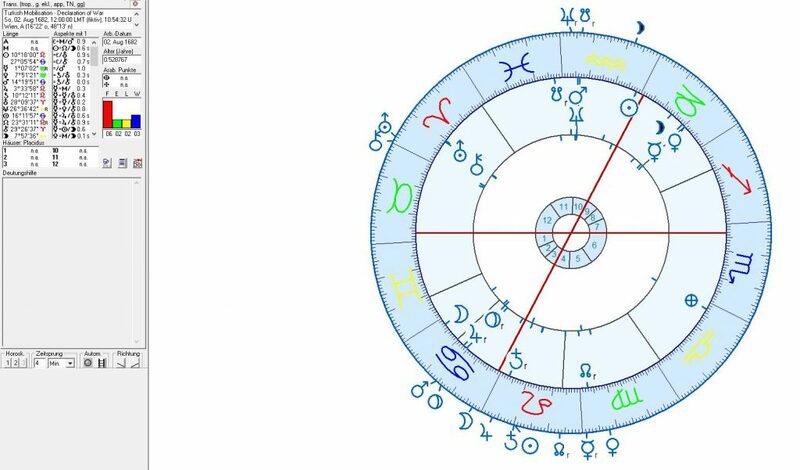 Astrological chart for the beginning of the Siege of Vienna on 29. Sep 1529 with transits for the defeat of the turkish armies under Suleiman I on 15 Oct 1529. The first turkish Siege of Vienna was carried out without tight transits of the systemically relevant outer planets Pluto, Neptune, Uranus and Saturn in relation to the astrogeographical resonance coordinate of Vienna. This could indicate that the attempt to conquer the city had little prospect of being successful as the vulnerability of the city`s defense system wasn`t a big enough factor for a defeat. A strong transits during the start of the siege was the transit of the Sun at 13°Libra exactly square the 13°Capricorn resonance degree of Vienna and as the ruler of the city`s resonance degree in Leo. As the planet of royalty it represented the presence of the Sultan with his harem and gold treasures on the battlefield and also the sheer size of the Ottoman armies estimated to have been minimum 120.000 men. The City of Vienna had been struck hard by the “Great Vienna Plague” during Pluto`s transit over the exact opposition to 13°Cancer coordinate of Vienna between 10° and 13° Cancer of 1679. The death toll it took is estimated about 12.000 victims. The plague did not affect Vienna alone but swept across large parts of Europe between 1675 and 1682. But the fact that it crippled the city is assumed to have tempted the turkish ruler Sultan Mehmed IV. to launch the 2nd turkish attempt to conquer Vienna. The timeline of events that led to the 2nd Turkish Siege and Battle of Vienna is an impressive documentation of the precision of my astrogeographical calculations. The 2nd turkish attempt to conquer Vienna was started through the mobilisation of the turkish armies from 21 January 1682 by ottoman Sultan Mehmed IV. War against Austria was declared on 6 August 1682 and the main Ottoman army finally laid siege to Vienna on 14 July 1683. The siege was ended when the Polish armies under King John III Sobieski arrived to lead the attack against the Turkish troops during the “Battle of the Kahlenberg” on 11 September 1683. 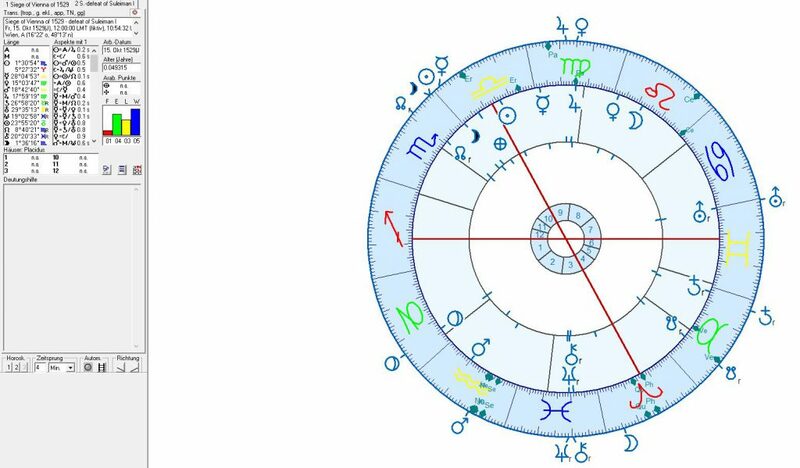 The turkish order of mobilisation was given under a Pluto-Jupiter conjunction between 13° and 14° Cancer exactly opposite the 13°Capricorn astrogeographical coordinate of Vienna. The conjunction of Pluto the planetary indicator the strife of dominance in group hierarchy with Jupiter the indicator for victory stands for the strife of fullfillment of the urge to represent the human superhero or best among hunters in persona and in Cancer the sign of ancestors and the morphic field of nations pointing at the expansion of euphoria (Jupiter) triggered by the self-image of the dominance as the strongest among nations (Pluto in Cancer as a representative of a tendency for an obsessive-compulsive disorder in regard to the self-image of dominant males). But howsoever intense this emotion may have appeared during the starting phase of the mobilisation, the logic of its projection onto Vienna had already passed its climax in the first half of 1682. At least this is the logic to be concluded from the fact that Pluto was about to continue his path an leave the exact opposition to Vienna behind. 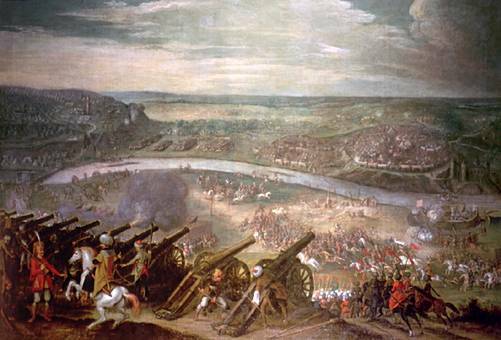 The main turkish army reached Vienna on 14 July 1683 with Pluto at 16°Cancer. During the decisive Battle of the Kahlenberg Pluto had reached 18°Cancer. 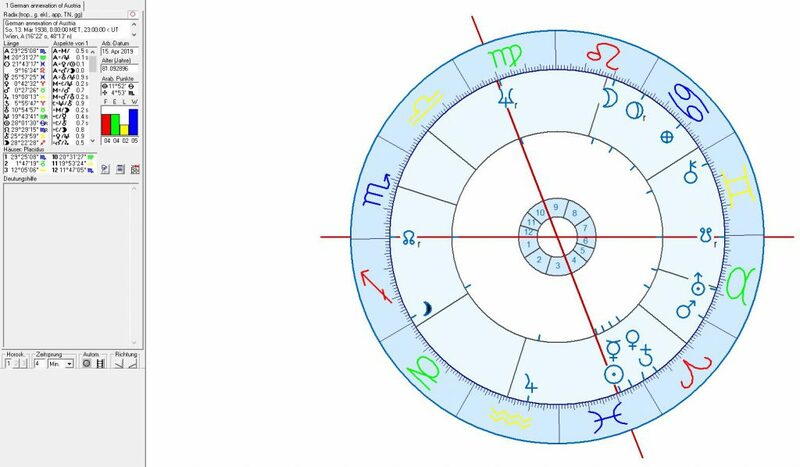 Saturn the astrological ruler of the Capricorn coordinate of Vienna and therefore an important indicator for Vienna moved over the exact conjunction with the 17°Leo coordinate of Vienna during the siege. Saturn represented a factor of stabilisation, strict laws and government control, fortifications and a general lack of food esp. shortage of carbon hydrates and sugar (Saturn in Leo), austerity and intense suffering.